I was blogging the recent coverage of the election of Barack Obama to the position of President of the United States of America, one of the highest things, when I thought, “Man what would it be like to blog for the President?” Then I thought, “was that a hologram?” More important than electing a multiracial, albeit Hawaiin, president, CNN unleashed the terrifying technology of holograms. I’m not a paranoid person by nature. I’m a paranoid person because everyone is untrustworthy. First, you also have to wonder whether they’re robots. Now, when I thought it couldn’t get any worse, I have to question whether they’re tangible robots or just holograms of robots. Holograms make me nervous. Then our parent company, the Reality Incorporated Corporation, came to my door and made me eat Holograhams™. They’re from the future™! 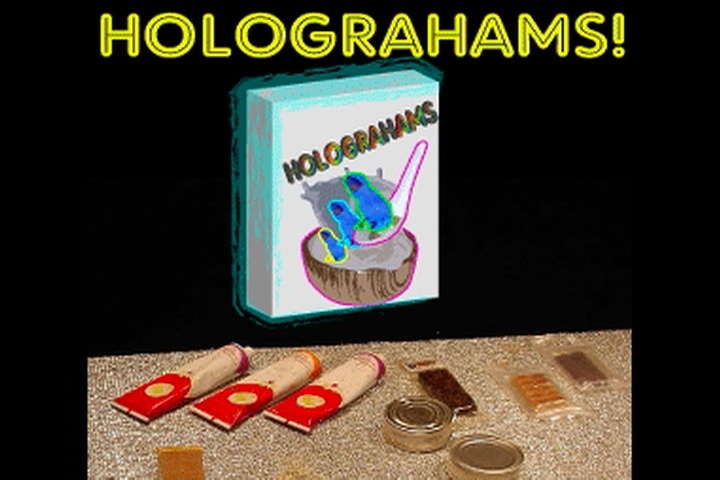 Now, whenever I’m scared of anything, I can eat a bowl of Holograhams™. Sugary sweet hologram marshmallows of Princess Leia all in a bowl. Just hologram marshmallows. It’s part of a balanced future™-breakfast and made by the Ukraine™. And, you know they’re real because they have a Certified Reality Product™ logo on them. So, you can rest assured that you’re actually ingesting hologram marshmallow and getting all the nutritional benefits you want from a hologram, unlike most cereals which are a socially maintained, group hallucination. Thank you Reality Inc. Co.! You are currently reading "Blog #15: A Blog-Ad for Holograhams™: They’re From the Future™!" Category: Blog,Holograhams™,Media,Reality™ Products,Text,Videos by mike!